Why are nested weights bad for performance? Alternatives? 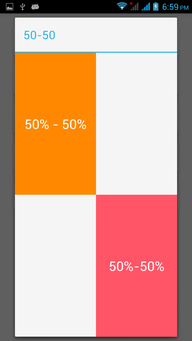 I have written a couple layout files where I used the layout_weight attribute to create a ratio between different views. At some point, I start getting lint warnings about nested weights. So, I wonder why are nested weights bad for performance, and if there is a more efficient way to create a constant ratio between view dimensions that could be used for different screen sizes and that doesn't need to specify a lot of dimension dpi values throught several layout files (for different screen sizes, I mean). Layout weights require a widget to be measured twice. When a LinearLayout with non-zero weights is nested inside another LinearLayout with non-zero weights, then the number of measurements increase exponentially. It's better to use RelativeLayouts and adjust your view according to the places of other views without using specific dpi values. Update: As we know the percent support library is deprecated from API level 26. ConstraintLayout is the new way to achieve the same flat xml structure. Consider this simple layout to demonstrate the same. Avoided performance degrader nested LinearLayout with weights.Really awesome!!!. I think (and I will probably be flamed for this), but again I think my phone has a quad core processor to rival (if not utterly destroy) most peoples home PC's. I also think this kind of hardware capability is the future of phones. So I come to a conclusion, that as long as you are not getting carried away with nesting (in MHO a layout should never be more then 4 levels deep, and if it is you are probably doing it wrong), your phone could care less about having weights. There are many things you can do that will have a much more far reaching effect on performance, then worrying about your processor doing some extra math. The main reason why nested weights are bad is that when a layout has children with a weight, it has to be measured twice (I think this is mentioned in the lint-warning). This means that a weighted layout that also contains a weighted layout has to measured four times, and each 'layer' of weights you add increase the measures with a power of two. In ICS (API level 14) the GridLayout was added, which allows simple and 'flat' solutions for many layouts which previously required weights. If you are developing for earlier versions of Android you will have a slightly harder time removing weights, but using a RelativeLayout and flattening as much as possible of your layout into that cab usually remove a lot of the nested weights. There is an easy solution to avoid nested LinearLayouts with weights - just use Tablelayout with weighSum and nested LinearLayout with weightSum - Tablelayout has the same attributes as LinearLayout(orientation, weightSum, layout_weight, etc.) and doesn't show message - "nested weights have bad for performance"
I think, the only alternative is to make a function that would be called onResume and will set all sizes and positions. Anyway, by weight you can set only sizes but no padding's (so layouts become even more complicated), no textSize's (impossible to compensate this somehow), let alone such things as number of lines. Not the answer you're looking for? Browse other questions tagged android android-layout performance or ask your own question. Is Android layout really exponentially hard? Why is Android lint showing “nested weights are bad for performance” when none are nested? Nested Weights Vs Nested Layouts with weights. Which is better?